Homes near ASU have been popular for a long time. When most people think of homes near ASU, they think of the Tempe real estate market which is understandable. Over the last couple of years, that area has been expanded to homes near the downtown Phoenix campus of ASU and, because of light rail, people can also easily get to either campus if living in any of the homes near the 20 mile light rail line. We like to remind people that homes near ASU are not just for students. We know of many neighborhoods where professionals, faculty, families and people of all walks of life enjoy living because of what north Tempe has to offer. You’ll find parks and recreation opportunities, a very good transit system, some really cool homes, all kinds of restaurants, excellent freeway access and a lifestyle not found anywhere else in Arizona. Many rental communities, condominium complexes and single family neighborhoods along the light rail line give people more choices than ever before. Of course, students have many advantages to living near ASU. Living in a home off campus and along the light rail line is convenient and can be very cost effective. Taking the light rail to school saves on car expenses, parking costs and parking hassles. By purchasing a “U-Pass,” students can use the light rail at discounted rates. With four light rail stations located very close to the Tempe and Phoenix campuses, students have embraced light rail more than people originally thought they would. If mom and dad can help with a “kiddie condo loan,” life can really be good. While homes near ASU can be looked at as a good financial move, there is also the fun aspect of living near the 20 mile light rail line. 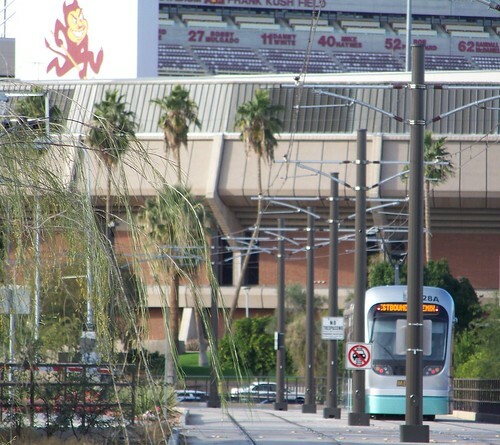 Easy access to restaurants, sporting events, the arts communities and job centers can be a great benefit to ASU students or to anyone looking for a convenient lifestyle where transit gets them just about anywhere they want to go. While we are BIG fans of living along the light rail line, we see many students ( and their parents ) often looking at homes off of the line but still close to campus, usually within the 85281 zip code. Homes in 85281 provide easy access to all of the cool stuff associated with being a part of the ASU community. If you are interested in homes near ASU, Rail Life suggests you contact Nick Bastian at Realty Executives in Tempe. Nick can be reached at 602-803-6425. You can search for homes here: The map below also shows an example of some neighborhoods nearby. By clicking on any of the green home icons you can get information about that specific neighborhood. Feel free to call and have us set up a customized search for your specific criteria! Remember, if you are buying OR selling a home near Arizona State University, contact us online or call Nick Bastian at 602-803-6425 today.